All the items shown on this web site can be purchased, and all contacts and ideas I get will be followed up with great interest. As a guide, prices start at less than a fiver for a bottle stopper or a small bud vase, candle holders are around £9, goblets are between £20 and £40, and salad and fruit bowls will vary between £30 and £100 depending upon size. Here are some of my most recent commissions. Commissions can vary a great deal. Sometimes it is a matter of mending something which is either old, or valued (or both), rather than making something new. There is an excellent example of this shown below, entitled "A Waterford Crystal Goblet". 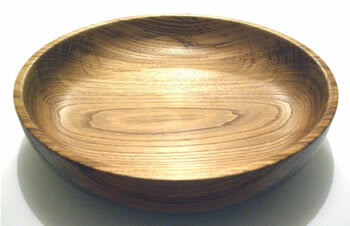 In recent weeks I have been doing some woodturning for Clare Goodman at The Wayside Pottery in Norfolk. I am happy to discuss collaberation of this type with anybody that might be interested. Wayside Pottery is a beautiful studio and creative workshop space set in the countryside of the Norfolk Broads. 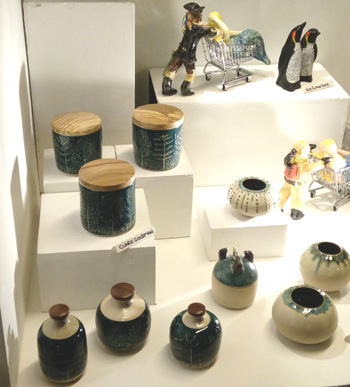 Clare is a potter and ceramic artist with a background in occupational therapy, and has combined artistic and therapeutic skills to offer a range of creative workshops, training days and tuition for organisations or individuals. She also produces a range of unique sculptural and functional ceramic pieces. Clare is a member of "Anglian Potters", a group of potters, collectors of studio pottery, ceramic sculptors, and a few pyromaniacs! Anglian Potters is a lively and thriving organisation that aims to provide the opportunity for members to meet and share their experience and enthusiasm about clay. 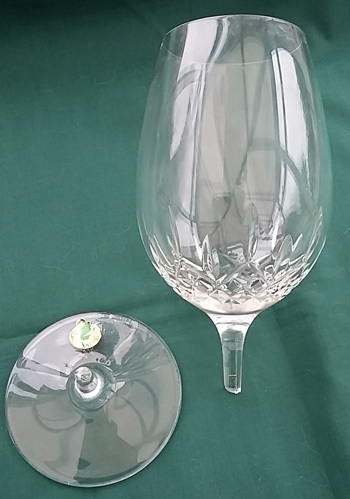 A lady by the name of Vicki Couzens contacted me, with a simple question, "Do you happen to know of anyone that might be able to make a wooden stem for a broken wine glass please". I was sent quite a large (and probably expensive) Waterford crystal goblet (I judged it to be about a half bottle size). On closer inspection I found that the glass was a lot larger than I expected, the base being about 90mm diameter, and the finished height would need to be about 263mm. 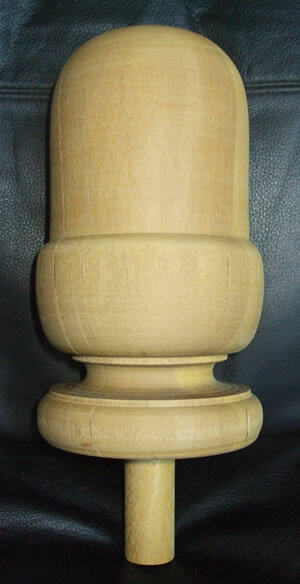 The urgent matter was to get a 4" Oak spindle. I cut a socket into the end which was a good fit for what remained of the glass stem, and then proceeded to make a new foot to give the correct finished height. Having sealed and varnished the piece, I bonded the glass into the base with 30 minute epoxy, and then gave it a final coat of varnish when the epoxy had set. Hope you all like the final result, shown on the right. It puts me in mind of that phrase from Forrest Gump, "life is like a box of chocolates, you never know what you're gonna get". 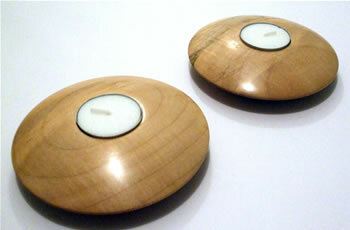 Two pairs of tee light candle holders, these are made from Rippled Sycamore and have been finished with friction polish. 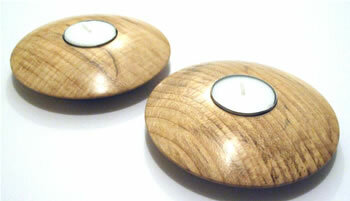 These Elm ring holders have been finished with friction polish. The pair were turned from one original blank, they are very similar, but are not identical. The same description applies to the twins for whom they were made. 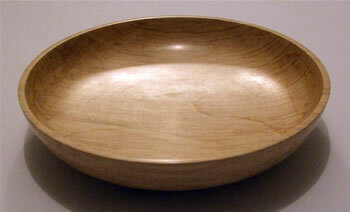 Two salad bowls for my old school mate and flying buddy, Nick. 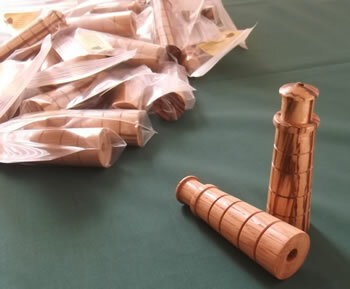 They are made of English Acacia and are sealed with finishing oil. 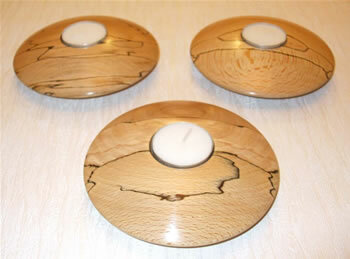 A trio of tee light candles for Liz, with a Melamine finish, they were made from some very nice Spalted Beech. 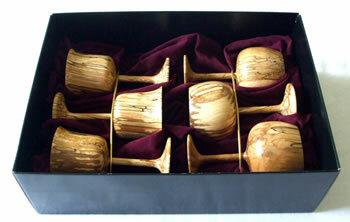 Eileen needed a set of goblets, in return for all the help and kindness given by her brother. While I was at a recent craft fair I spoke to David Lewis. He needed some trim rings and covers for the port holes in his boat. 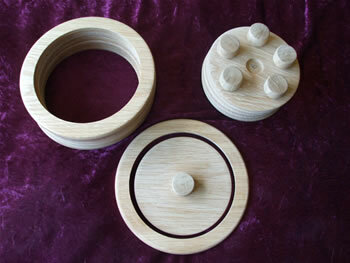 After a false start due to bad timber this set of covers and rings were made from American White Oak. 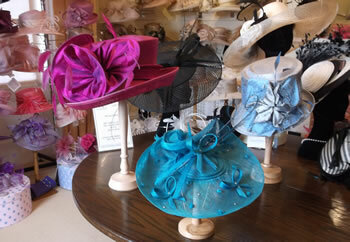 Our younger daughter recently got married so she that must be obeyed needed to hire a hat for the occasion. 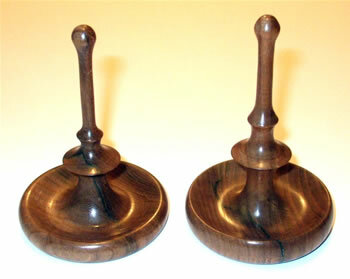 A visit to a local hat manufacturer resulted in both a hat being hired and a commission to make some hat stands. Word got passed via the Potter Heigham pen brigade to Richard Green (a local farmer) that I would be able to do some wood turning for him. Eventually the request came in: 'Can you make me a pair of acorns to a specific pattern, and as large as possible'. Richard gave me 2 pieces of Greenheart Oak, both a little over 140mm square and about 360mm long. 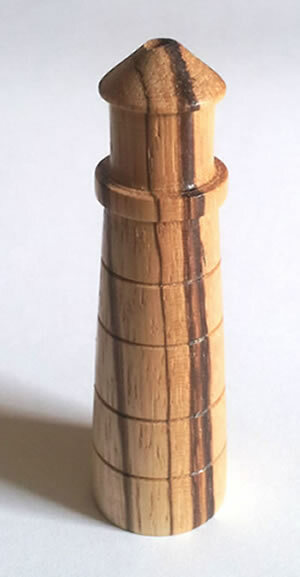 I had to reduce the length a little so I could get the work between centres, and even then the lathe struggled for a while until the blanks came into balance. The outcome was very pleasing, and Richard was happy with the results. The finished pair each measured 270mm head to toe and were 120mm in diameter. 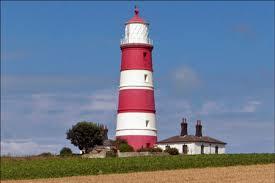 The Friends of Happisburgh Lighthouse, through membership subscriptions and fundraising events, are a vital source of regular funds to enable the Happisburgh Lighthouse Trust to maintain and operate the Lighthouse. I was very pleased to help the Friends by making them some lightpulls. Needless to say, they came in the form of a scale outline of the lighthouse. I hope they sell well for the Friends. You know how it is, sometimes, you get a job to do and circumstances are just right. You get straight on with it, and all of a sudden it is complete, to the delight and amazement of others. Wednesday afternoon on 26th February 2014 the phone rang. It was a lady by the name of Tess Townsend wanting a goblet with 2 captive rings, oh, and it needs to be a bit taller than what I normally make. The only catch was that she needed to be able to take it to Australia as a wedding gift on March 21st. Actually, the challenge was that I was due to go on holiday on 8th March, and leaving the job until I got back was not practical. In short, I happened to have an un-allocated piece of Yew sitting in the workshop, 3" square and 9" long, just the job. I set about making the goblet there and then, no measuring to do, just get on with it. As it happens, it was the first bit of hollowing I had done since Christmas when I got a new Simon Hope carbide hollowing tool, it did really well on the Yew. All in all, the job was complete. 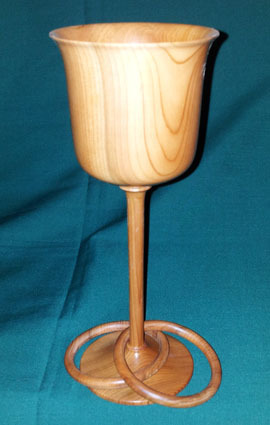 By 7pm I had a goblet 7.5" tall instead of my normal 5", and it was posted out first class on Thursday morning. Tess emailed me on Friday to say "The beautiful goblet has arrived safely. Thank you so much for your brilliant service. More than happy with what you have produced for me". As I said earlier, sometimes it just works out right. 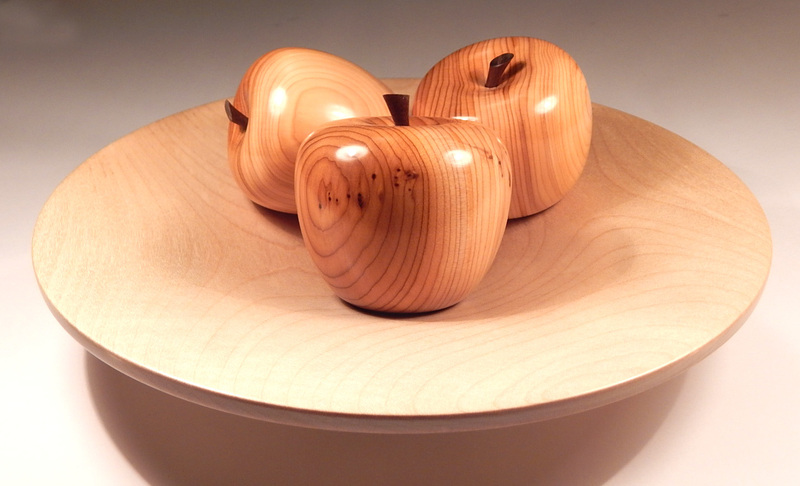 At a recent craft event, a lady asked me to make some Spalted Beech apples, and when they were done, she would probably order a platter to put them on. 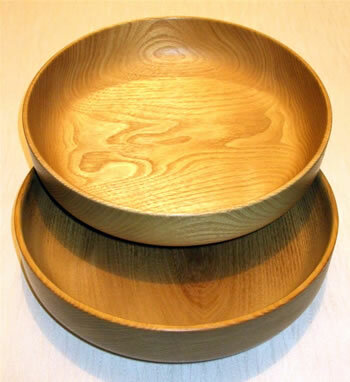 The day came to collect the 3 apples, and she decided that what she really needed was a pale platter (Sycamore) with 3 Yew apples on it, in addition to the 3 she had already bought and paid for. I hope she likes them. 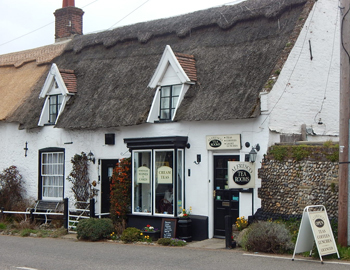 My good friends Tony and Leslie Wright run the Alfresco Tea Room in Ludham, where quality produce will quench your thirst and appetite without breaking the bank. If you are in the area, pop in and see them rather than simply driving through. 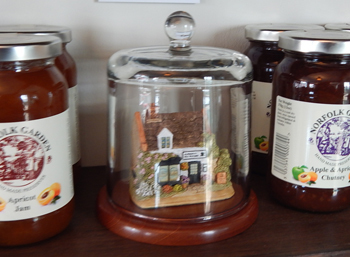 The tea room is open between 10am and 5pm from March to November. 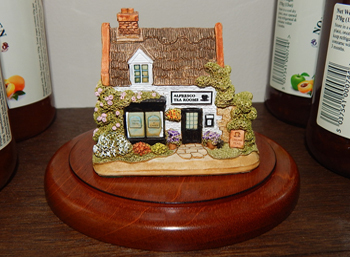 Tony asked me to make a dark (Mahogany) base to go under the "Lilliput" model of the tea room. This was a simple and pleasing little job that turned out well.